Celebrity, casting and The Runaway Bride (2006) | Randomwhoness: a Doctor Who blog by Johnny Spandrell. Sampling stories in random order. 8 July 2006. The broadcast date for Doomsday in the UK. The episode reaches its devastating conclusion, and the Doctor is alone, crying in the TARDIS. But there’s a surprise in store. Suddenly, a bride is in the console room. Then she turns around, and blimey! It’s TV comedy star Catherine Tate! How very dare you! Shortly after that (or even before it, as international time zones dictate), the episode is bit torrented around the internet and is being enjoyed by fans all around the world. If you were in Australia, the moment went more like this: The episode reaches its devastating conclusion, and the Doctor is alone, crying in the TARDIS. But there’s a surprise in store. Suddenly, a bride is in the console room. Then she turns around, and um… who is that woman? The Catherine Tate Show was yet to air in Australia by Christmas 2006. Probably in the US, Canada, New Zealand and all sorts of other Who sales territories, I expect. The point is the casting of a well known performer or a celebrity with a high profile in the UK – stunt casting, as it’s called – doesn’t necessarily have the same impact when viewed around the world. So let’s say you’re an Australian fan, and you’ve just watched Doomsday. 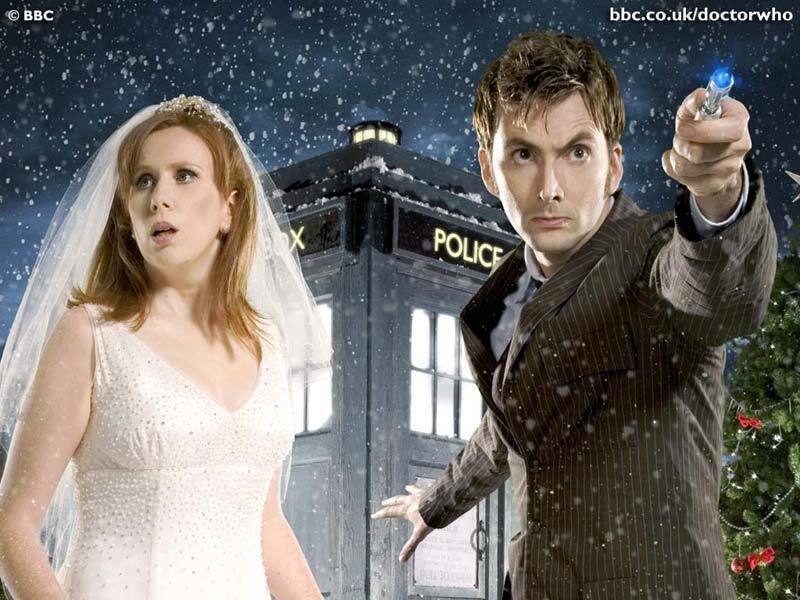 Confused (rather than thrilled) by the surprise ending, you read the credits and discover that the Bride is played by Catherine Tate. Next stop Google: who is Catherine Tate? Why is she suddenly on my favourite show? And why does Doctor Who expect me to know who she is? And so you swot up on Catherine Tate. Oh, she’s a comedian. Oh, her show’s popular in the UK. OK, she’s stunt casting. Great. Now I’m up to speed. This is familiar territory to Australian fans (and I suspect to all non-UK resident fans). It went on during the classic series: your Beryl Reids, your Ken Dodds, your Faith Browns. All celebrities whose import was lost on us. Hale and Pace we knew as their show had been shown in Oz. Nicholas Parsons had at least been a punchline on The Goodies. But the most potent pre-Tate example from the classic years is Bonnie Langford, cast as companion Mel in 1986. Her varied career, which included a lot of song and dance, caused her Who performance to be greatly prejudged. Much of this critical commentary came from the UK, and was reported in the fan press in Australia. Langford was not well known in Australia then (or now, I suspect), and so much of the outcry was hard to contextualise for Australian fans. I found myself trying to imagine an Australian equivalent, and the closest I came to was Rhonda Burchmore, the vivacious, red headed song and dance performer. The upside of this is that non-UK fans were able to view Langford’s performance without the associated baggage complained of by British Who-heads. (I still have no idea what a ‘Violet Elizabeth Bott’ is). There was no instant reaction of seeing Langford’s celebrity image jump out of a Doctor Who story at you. We viewed Mel in a way UK fans could not. Sometimes it works in reverse. Langford’s co-star in The Trial of a Time Lord was Michael Craig, in the early 1990s well known in Australia as a crusty old doctor in medico drama GP. To this day, he looks very out of place in that Vervoid story to me. I expect him to be handing out prescriptions and bitching about patients. Years later, The Christmas Invasion featured Adam Garcia, latter day dance show judge, but then not widely known in the UK. But in Australia, he’s forever that guy from ‘blokes take up tapdancing’ movie Bootmen. So in every second scene it’s ‘Look! Adam Garcia’s on Doctor Who!’ So it is possible for international viewers to be distracted by celebrity casting. And Peter O’Brien, star of bloody everything on Aussie TV, is a weirdly familiar face in the otherwise gripping The Waters of Mars. The biggest example though, shared by UK fans, Australian fans and fans all over the world, was Kylie Minogue, guest companion for 2007’s Voyage of the Damned. I found myself watching that episode actively trying to put her celebrity aside. ‘Concentrate on her performance! I can’t, it’s Kylie!’ Does that casting work? Yes, in a sense that it was watched by about a gazillion people. Did she effectively transcend her celebrity identity though? Does it even matter? New Who started of course by casting a celebrity in Billie Piper (not hugely well known in Australia, but there were more than a few copies of Honey to the B on cassingle lurking in Aussie homes), a move which proved shrewd in many ways, the most important being that she gave a great performance. But like Kylie, she also attracted a fan base and generated media attention. And it struck an early note for the new series that casting actors with a profile can work. These days it’s the norm; we expect big name stars in the show. Derek Jacobi, Michael Gambon and John Hurt fall into the ‘respected thesps’ category. David Walliams, James Corden and Frank Skinner are (like Tate) the ‘comedian/actor’ type. Richard Dawkins, Patrick Moore and McFly are the ‘big enough names to exist in both Doctor Who and the real world’ type (but to be fair these are more jokey cameos than legit performances). Catherine Tate as it turns out is unique; the only stunt casting to transfer to a series regular. (Langford is also stunt casting, but was always intended to be a regular) And a hugely successful one; Doctor Who Magazine‘s first 50 years poll showed Donna to be readers’ favourite companion after perennial favourite Sarah Jane Smith. Proof, if any is needed, that the right person in the right role works regardless of their previous track record. We can expect more of this to come. We eventually got to see The Catherine Tate Show in Australia. For me, watching it was experiencing stunt casting in reverse; it was ‘that woman from Doctor Who‘s sketch show’. And of course it was excellent. The first episode I caught included a running series of sketches about the persecution of redheads. Tate played some redhead political prisoner. Finally one day her struggles pay off and she’s released from prison. She hears that a biopic of her is in production. ‘Who’ll be playing me?’ she asks. ‘Bonnie Langford’, the answer comes back, and Tate walks proudly off. How appropriate! The original redhead stunt casting companion. LINK to The Macra Terror. Both have creepy crawly monsters; crabs and spiders respectively. NEXT TIME… You’re not from Social Services, are you? We’ve got a bad case of the Night Terrors. Previous PostMind control, mine controls and The Macra Terror (1967)Next PostFathers, children and Night Terrors (2011). This article feels weirdly prescient of Matt Lucas’ casting.